I don’t often focus on beauty on this blog, as it’s definitely not my speciality, and to be honest, it’s always been something that I have struggled with. I’ve suffered with acne, in varying forms and severities, over the course of the last 10 years or so, and so skincare has always been a love hate relationship for me as a result of that. If you’ve suffered with acne I’m sure you will relate to this feeling of desperately needing all these products in your life to sort your skin out, thus spending fortunes on everything that has ever been recommended, whilst also resenting all of said products for not sorting your skin out. Skincare is frustrating when you can’t quite figure it out, and for some it takes a lot longer than others to find what works for your own skin. 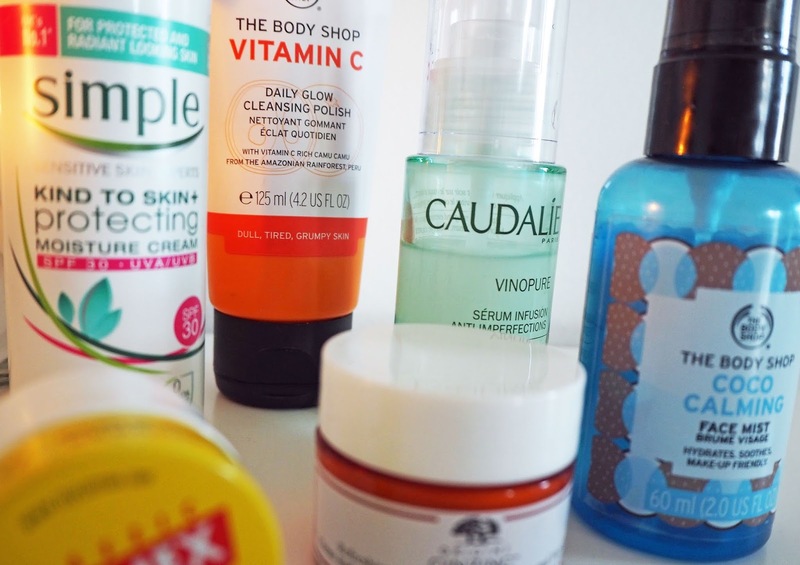 You can read more about my personal skin struggles in particular here if you fancy. All that said, the past 6 months or so I have really seen a change in my skin. I don’t know whether it is my age (waaa), my hormones finally levelling out and coming to some sort of agreement, or just some simple updates I have to my skincare routine. I reckon it’s a combination of the above, but I’ve really been enjoying my skincare routine for the past few months and feel like I’ve really got it ‘down’ for me and what my skin wants at the moment. Either way, I wanted to share my routine on here as I really love these products, so other people probably will do too. Vitamin C skincare seems to be a pretty huge trend at the moment, with that ‘natural’ instagram-glow that we all want being sold to us in the form of good old vit-c. Before picking up this face wash, I had mainly seen it in serum forms, which I had been tempted by, but too scared to try as it sounded like something that would be quite thick and greasy, which on my spot-prone skin is a recipe for disaster. Anyway, it was a perfect harmony when I found this face wash, in The Body Shop- which, by the way, is a shop I have fallen back in love with lately after kind of forgetting about it for a few years. It’s a scrub I use every other morning to wake my face up, and it feels so awakening and fresh on the skin, not to mention the divine citrus smell. It is a gentle scrub so personally it’s something I don’t feel I need every morning as my skin is pretty sensitive, so the days I don’t use it I simply start my morning routine washing my face with warm water. 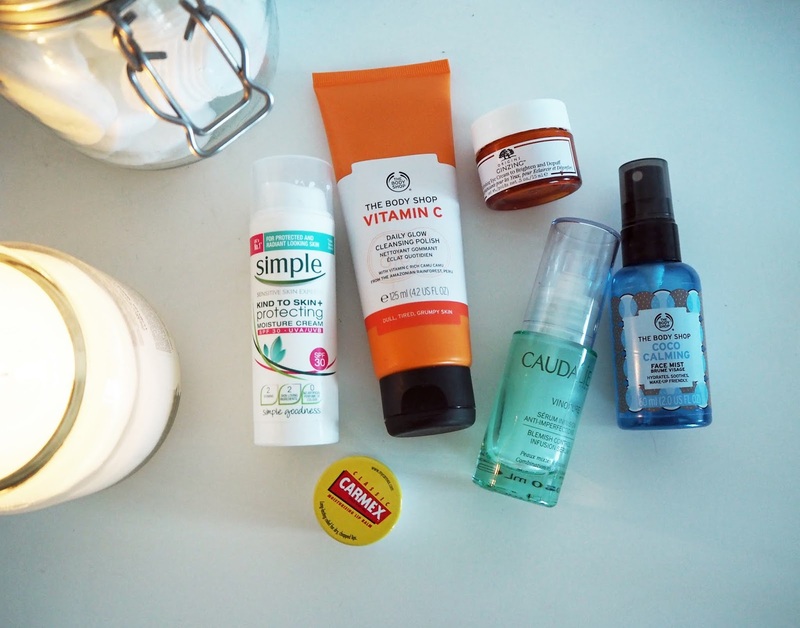 Don’t be worried it simple, simple skincare can often be the most effective. Eye cream is one that’s new to me. I asked for this for Christmas and since using it daily I’m not sure how I managed without it. That sounds quite dramatic I know, but it really does make a big difference, especially to how my concealer applies, and lasts, throughout the day. 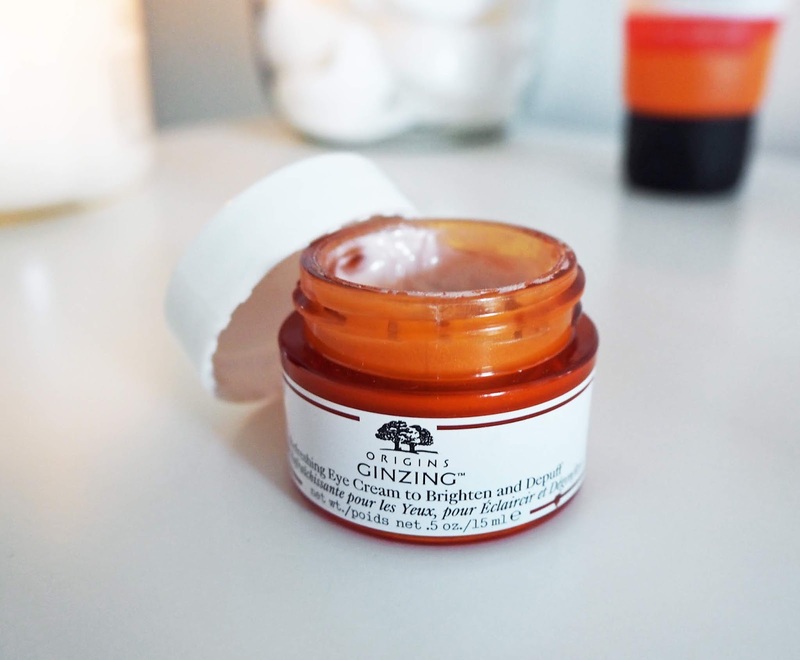 I had heard a lot about Origins Ginzing as being great for waking up those tired under eyes, and heaven knows I need all the help I can get in that department. I get pretty dark circles, no matter how much sleep I get and how many litres of water I guzzle, but this really does seems to help brighten them. And it feels lovely too. The Caudalie Blemish Serum is probably the boujiest part of my skincare and was inspired, and dare I say, influenced, by one of my fave ‘influencers’ of them all – Sammi– back in August/September time last year when she brought the brand to my attention. They were actually offering free samples of this serum at the time, of which I quickly nabbed one, and fell in love. As I said already, I have struggled with particularly problematic skin for a decade or so, so anything claiming to tackle that for me, and I’m more than happy to give it a go. This was different to any other sports products I have tried before. It wasn’t harsh and didn’t smell of chemicals. It smells like a luxurious face product that normal I wouldn’t be able to use as it would be too fancy-shmancy and would break me out. But this bad boy really does help my skin out when I need it most. I apply a thin layer after I have washed my face in the morning and it seems to keep breakouts at bay, and help any ones that do poke through to not get too-angry, and heal quite quickly. 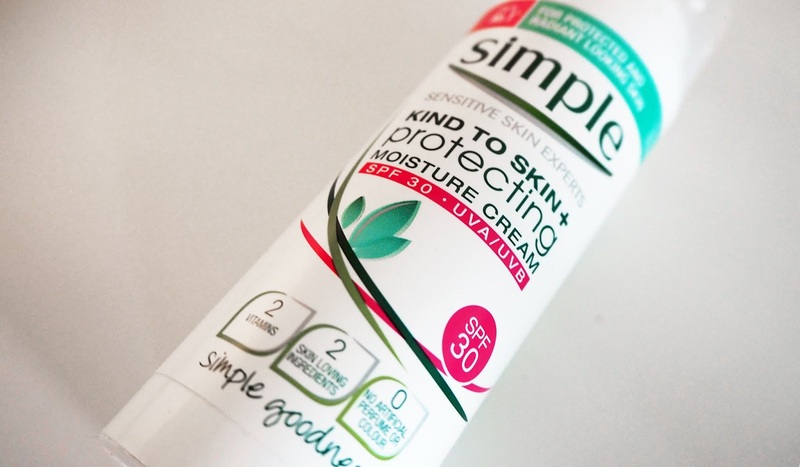 I had been skeptical initially buying this from Simple, as I haven’t gotten on too well with some products form the brand when I was younger. I honestly only bought it as it had been the only moisturiser I could really afford when my last one ran out before payday in January (real talk). And was impressed that it was SPF 30 as that’s something I’m consciously trying to wear everyday. I seem to be getting on with it ok so far, I apply a small amount after my Caudalie serum and let that sink in, and then I also mix it in with my tinted moisturiser when doing my make up to make it all look a bit lighter and get that natural vibe as much as I can. It does have a hint of that sun-cream smell, which I’m not too sure about, but other than that I’m quite liking it. It sinks in quickly does what it says on the tin really. Lip Balm is a big part of my life, I won’t hide from that. I’m someone you can always rely on to have a lip balm in my bag wherever I may go. And it would definitely be my desert-island item if I could only take one. 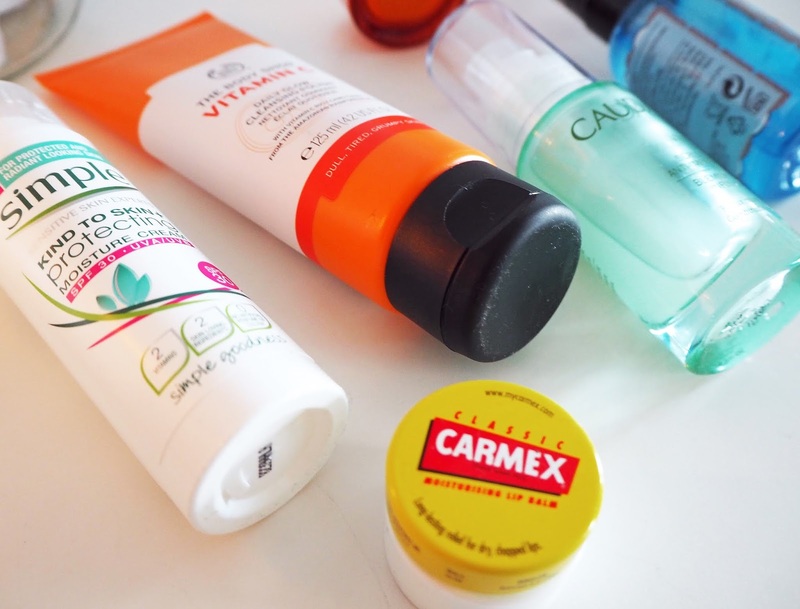 Carmex is my all time fave as I love that tingly feeling it gives you, and it seems to last longer without feeling like I need to constantly re-apply like a lot of lip balms do. I’m sure you’ve all used this over and over so I won’t go on and on, as there really is only so much you can say about a lib balm. But Carmex is great. Last but definitely not least is this Face Mist. I used to use a Loreal making setting spray which was great, but I had been on the hunt for more of a moisture surge spray to spritz over my make-up. 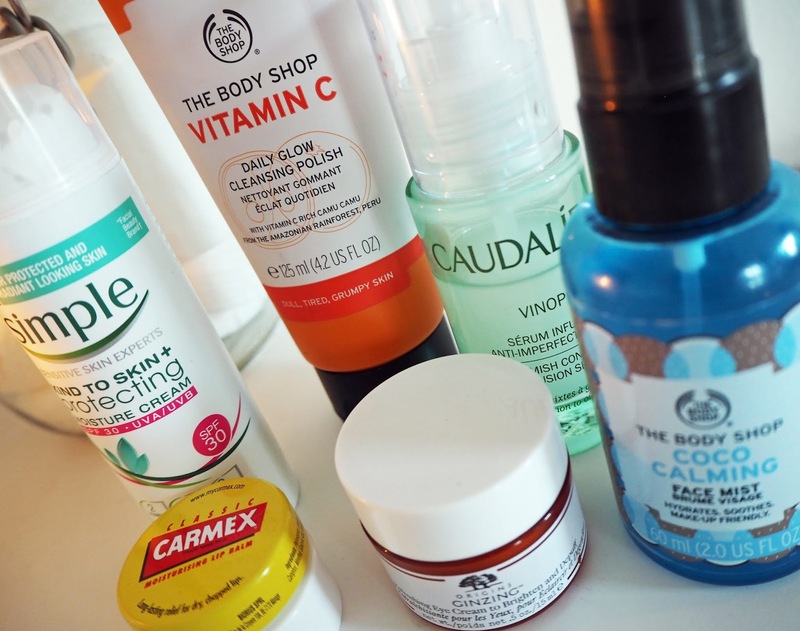 Around December time the drop in temperature really started to affect my skin and I was finding my makeup clinging to dry patches that I didn’t even know I had. 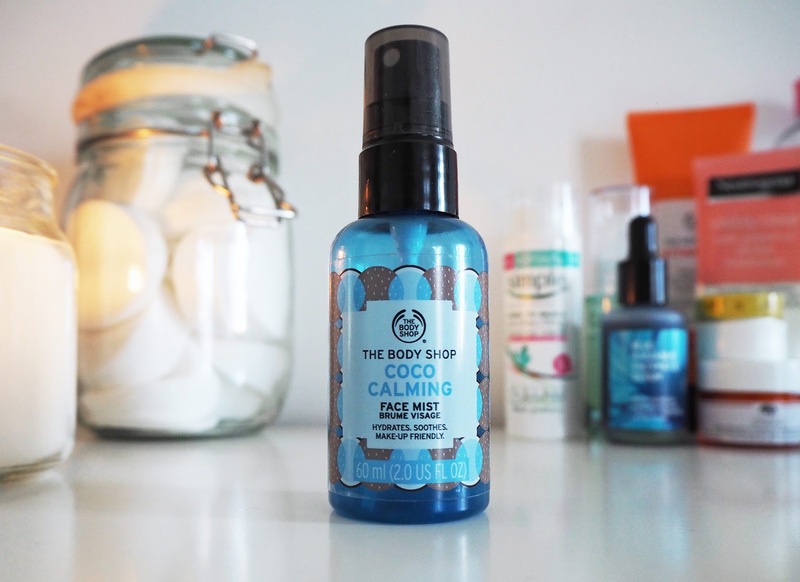 Then The Body Shop came through for me yet again (this is not an ad), as I discovered their range of facial spritz’. 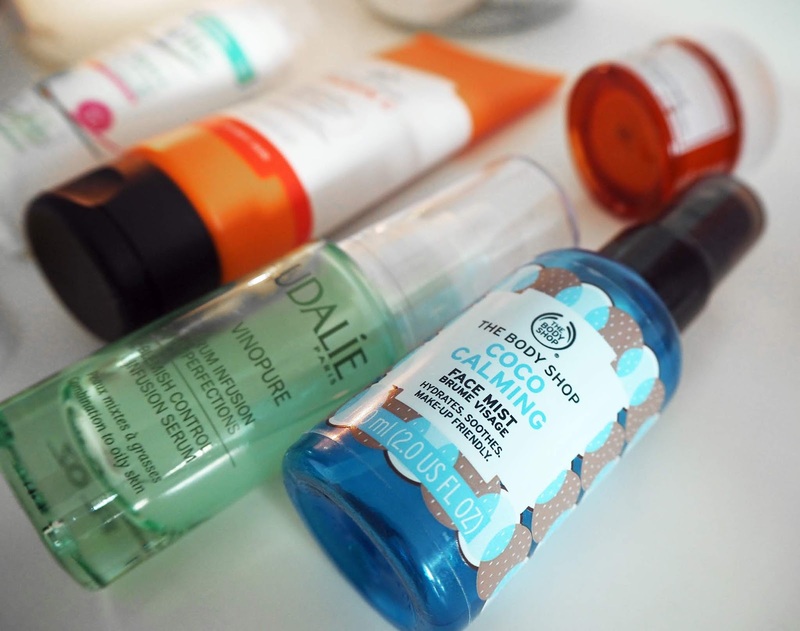 There’s quite a lot to chose from in the range, and I want to try them all, but I obviously opted for the coconut calming face mist which you can see. It’s so so lovely. I spray quite a lot on over my finished make-up as I just love how it feels mainly. 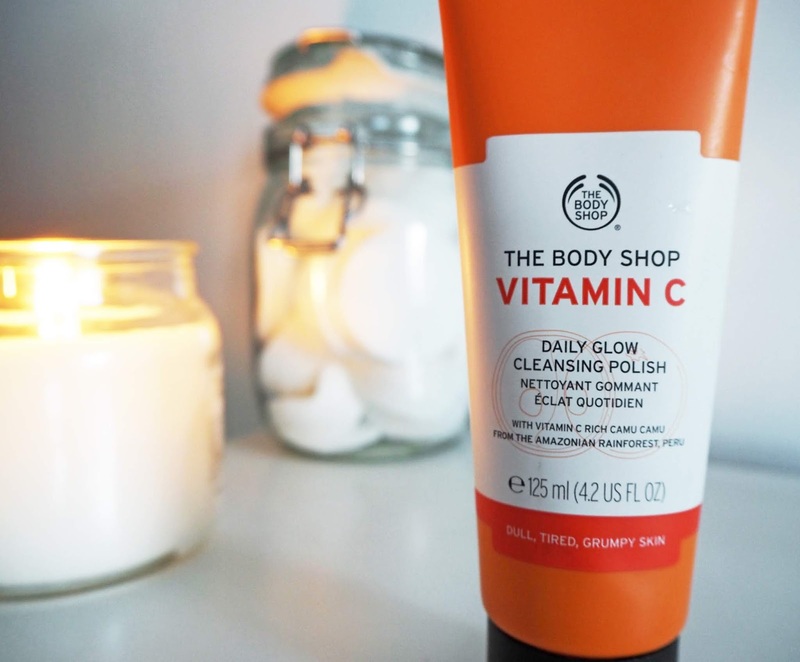 I also find it settles into the skin pretty quickly and makes such a difference to keeping your skin look hydrated all day, rather than seeing those dry patches creep in in the afternoon. It’s a thing of the past for me since I brought this spray into my life. 10/10 would recommend. That’s about it for my morning skincare currently. Any questions feel free to ask in the comments below, and I hope you enjoyed reading something a little but different from me today. What are your must-have morning products?